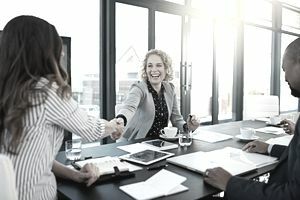 Why take the time to congratulate someone for getting a promotion? For starters, it’s a nice thing to do. Everyone enjoys getting some well-deserved praise. When it’s your turn to advance at work, you’ll appreciate hearing well wishes from your friends and co-workers. Beyond that, notes like these are relationship builders. They’re similar to thank-you notes, in that they show you’re a thoughtful person who values other people’s time and efforts. The best networking happens when you think about what you can do for other people, rather than how people can help your career. Take a moment out of your day to congratulate someone on a promotion, and you’ll strengthen your connection to that person, as well as brighten his or her day. Think about the recipient. Is this an email to a good friend or to a business associate? Your relationship with the person will shape the tone of the letter. If you are close (a good friend or family member), you can be a bit more informal. For any other associates, keep the letter strictly professional. Write it as soon as possible. Don’t wait so long that the recipient doesn’t even know why you are sending it. As soon as the promotion is made public, feel free to send a congratulatory email. State the specific occasion. Explain up front why you are offering your congratulations. This way the recipient knows the purpose of the email immediately. You might also state the specific occasion clearly in the subject line, so the reader knows why you wrote before even opening your email. Explain how you know. How did you hear about the promotion? Share how you found out the news, especially if you haven’t been in touch with the person in a while. Perhaps you saw the promotion on LinkedIn, or a colleague told you. Make sure they know your source. Express praise and approval. Emphasize your approval of this promotion – you might mention that you always knew they were right for this kind of job or that you can’t think of anyone better suited for the position. Edit, edit, edit. Like any business letter or email, be sure to proofread the email before sending it. If you are networking with someone, you want to appear as polished and professional as possible. In any piece of communication, typos and grammatical errors diminish the impact. Overdo it. Avoid too much or exaggerated praise. This might unintentionally come off as sarcastic or ingratiating in an email. Lie. Most people are bad liars but are really good at telling when someone else is insincere. If you don’t think they’re qualified for the job, don’t send a note. If you’re sincere in your congratulations, focus on the positives, but don’t stretch the truth. For example, when congratulating your super-creative friend who’s bad with minor details, focus on his vision for the big picture. Go long. Keep your congratulations and praise short and to the point. The reader is likely busy with his or her new job and would appreciate a concise message. Focus on the negative. Keep any negative feelings (either about the promotion, the job, or the company) to yourself. This email should be all about sending a positive message of congratulations to the recipient. Again, if you don’t mean it, don’t send it. Suggest how you can benefit. You might be sending this message in part as a way to network with someone. However, do not talk about yourself in this email. Focus only on congratulating the person. If you want to request something from this person in the future (such as an informational interview), do it in another email later. Your congratulations won’t seem heartfelt if they’re immediately followed by a request for help with your own career. Forget about other times when congratulations are due. Promotions are just one opportunity to show a friend or colleague that you’re thinking of them and wish them well. For example, maybe you have a connection who just scored a new job. Now’s a great time to drop them a line and say congrats. There are plenty of other times when a note of appreciation is appropriate, too. Use this email as a model for your own letter of congratulations. Browse even more sample letters of congratulations for further inspiration. Congratulations on your promotion to Vice President of Pumpkintown Savings Bank. I heard about your well-deserved promotion through LinkedIn. You have done a fine job there for many years, and you deserve the recognition and responsibility of the position. Best wishes for continued success in your career.